Last month, as news began to emerge of how the Israeli state was planning to politicise and militarise the Eurovision Song Contest, the Irish Campaign to Boycott Eurovision 2019 in Apartheid Israel wrote to RTÉ, Ireland’s national broadcaster, with a series of questions regarding how these manoeuvres were going to be dealt with. Almost a month later, and despite following up, RTÉ have refused to respond. What steps are RTÉ taking to ensure that the Irish act chosen for this year will not perform for soldiers from the Israeli military? It should be absolutely unthinkable that the national Irish broadcaster would facilitate or participate in providing entertainment to the Israeli military. These soldiers are members of an army which has been repeatedly accused of war crimes by the United Nations and human rights organisations, and that regularly deliberately kills Palestinian civilians, including children? The Israeli military also routinely spies on LGBTQIA+ Palestinians in order to extort/blackmail” them and “turn them into collaborators”, as revealed by former Israeli intelligence operatives in 2014. If RTÉ is not taking any measures to prevent such an outrageous performance from happening, it is simply not credible for the broadcaster to stand by the assertion that the Eurovision is a “a non-political music event”, especially as the cultural privileges of Israel’s occupation forces are being subsidised by Eurovision ticket prices. What steps are RTÉ are taking to ensure that no illegal Israeli settlement propaganda is broadcast? Given the revelation that the locations on the “visual postcards” to be broadcast between acts will feature the occupied Golan Heights among other places, likely including the Old City in Palestinian East Jerusalem, it is clear that Israel intends to use the event to portray land that is internationally recognised as occupied and illegally annexed – including by the Irish government, the EU, and the UN Security Council – as being part of the Israeli state. Surely RTÉ will not allow itself to be put in a position where the Irish national broadcaster will transmit such crass propaganda, which ignores international law into license payers’ homes? Does RTÉ believe it is acceptable, or in line with its principles, to allow the Irish entrant and their team to be hosted on ethnically cleansed land which forcibly exiled refugees are still banned from returning to? The 2019 Eurovision Village is set to be built on the ruins of the Al-Manshiyya quarter of Jaffa, which was ethnically cleansed of its roughly 12,000 Palestinian inhabitants in April 1948 by Zionist paramilitaries. These refugees and their families remain forcibly exiled by the same state that is hosting the contest. The building of this village and the hosting of contestants on ethnically cleansed land is a deeply political act, and one which no person or broadcaster of conscience should be complicit in. These were the simple yet very important questions we addressed to RTÉ. RTÉ have chosen to ignore our queries. RTÉ have ignored the 17,000 people who signed a petition calling for an Irish boycott of the competition. 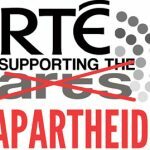 RTÉ have ignored the call for a boycott from the Palestinian people. RTÉ appear determined to plough on with participation in what will in fact be an overtly political and militaristic event, which seeks to whitewash and normalise Israel’s colonial apartheid regime and its brutal oppression of the Palestinian people. There is still time for RTÉ to change its mind. There is still time for the broadcaster to stand on the right side of history. We urge it to do so. In the meantime we ask you to sign our new petition asking Sarah McTernan to listen to the calls for a boycott from Palestinians, from Irish people, from human rights campaigners, from LGBTQIA+ groups, and from artists all over the world.